There are many books available about Fatima, especially during the 100th year anniversary. 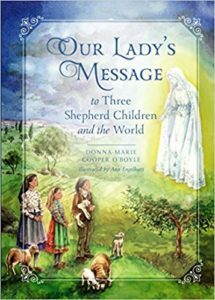 Our Lady’s Message to Three Shepherd Children and the World is written in such an excellent way that it is my choice for teaching children about Mary’s appearance in Portugal during WWI, whether in a classroom situation or in a family setting. The author’s voice is relaxed and engaging as if a parent or grandparent is telling the story. Intertwined in the retelling are: Bible references, lessons every Catholic should understand, and questions to prompt deeper reflection about Mary’s message. At times the author emphasizes the important points of a section by restating the facts as a summary, which helps the reader focus on the main idea. The story begins with interesting background information about the everyday lives of Lucia, Jacinta, and Francisco and that provides a necessary understanding that they were just typical children. It continues with very descriptive accounts of the three visits of the Angel of Peace and the lessons which prepared the children for the Blessed Mother. The first apparition of Mary is recounted by Lucia in beautiful detail. After that, each month’s message to the children is described thoroughly. The children were asked to accept two great missions – self sacrifice and probably the most familiar of Mary’s requests, to pray the rosary every day. The children readily agreed even though they understood that it would be very difficult. Other well-known facts of the story are also explained: the three secrets, the threats and harassment of government officials directed at the children, and the miracle of the sun. An interesting bit of information that is not always mentioned in the retelling of the story is Mary’s request for Lucia to learn to read. The story continues after Mary’s appearances have ceased. The details about Jacinta’s and Francisco’s inspirational lives before their deaths and Lucia’s simple life as a nun and her continued mission to spread the devotion to the Immaculate Heart of Mary are carefully explained. I understand some parents have trouble talking to their young children about hell. A parent of a student once asked me if I was going to talk about hell during our religion lessons because she did not want her child exposed to that subject. For this reason I’m mentioning that the shepherd children’s vision of hell is described in this book, but not in great detail. On the other hand it is good to remember that Francisco was 9 years old and Jacinto was only 7 years old at the time of the apparitions, and Mary did not think they were too young. Draw a picture of the Blessed Mother using Lucia’s description of Mary during the first apparition. John Paul II consecrated Russia and the world to the Immaculate Heart of Mary twice. The first consecration was on Mary 13, 1982 and then again March 25, 1984. Lucia stated that the consecration had satisfied the Blessed Mother. The proper way to pray the rosary is explained at the end of the book. CCC 946 After confessing “the holy catholic Church,” the Apostles’ Creed adds “the communion of saints.” In a certain sense this article is a further explanation of the preceding: “What is the Church if not the assembly of all the saints?” The communion of saints is the Church. Luke 15:4 –The Lost Sheep – This story is referred to when explaining that the children also cared for their sheep. Heb 1:14 – When the Angel of Peace appears there is also a short lesson on angels. Read this article, “Devotion of the Five First Saturdays” , to learn more.